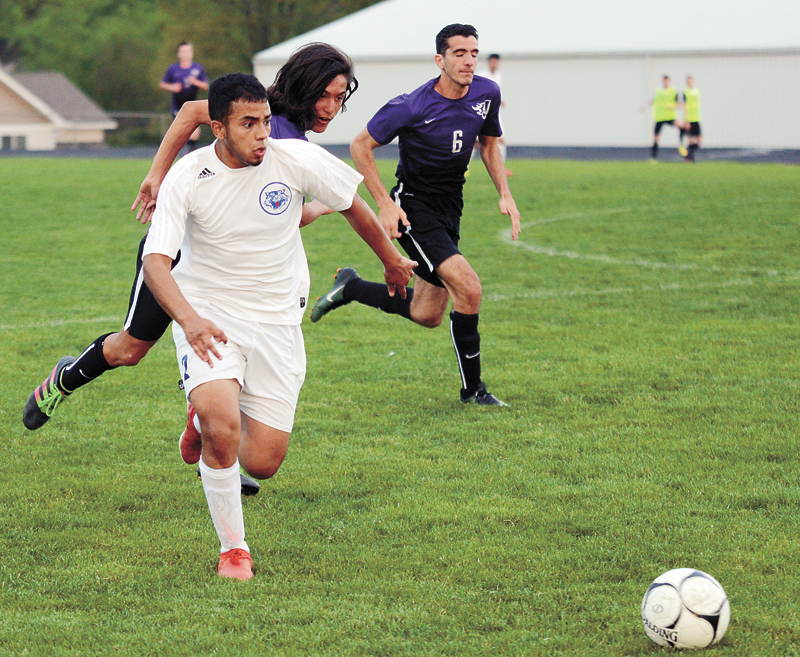 T-R PHOTO STEPHEN KOENIGSFELD • Luis Angel Fernandez runs down the sideline, working to beat Johnston defenders during the opening minutes of Monday night’s game against the No. 9 Dragons. 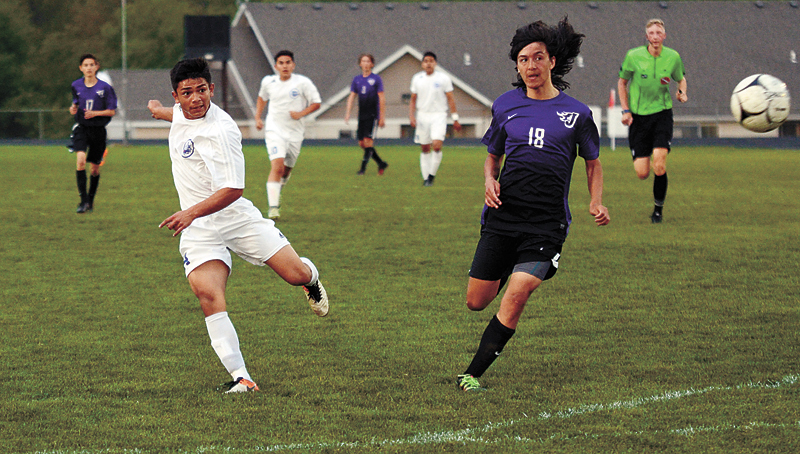 Fernandez had the lone Bobcat goal in the seventh minute, as they fell 4-1 to the Dragons on Senior Night. Monday night’s match between Marshalltown and No. 9 Johnston was the perfect balancing act. It was a test to see who could put together the most complete plan and execute it with as few blemishes as possible. By the time the buzzer sounded twice, the scale was tipped in the Dragons’ favor, as they scored four unanswered goals to top the Bobcats 4-1 on Senior Night. Luis “Toni” Angel Fernandez had a great spot from a teammate at about the 18-foot mark in the sixth minute and took a strike that landed right in Johnston (9-3) goalie Alex MacGregor’s hands. But the second time was the charm for the Bobcat junior. Again, on a perfect drop, Fernandez took the ball inside the 16-foot box, maneuvered around a defender and blasted a strike right on by MacGregor at the seven-minute mark to take a 1-0 lead. The first half came in acts for the Bobcats. The first 10 minutes were contested at or around midfield for most of that time period, despite Fernandez landing two shots on goal. 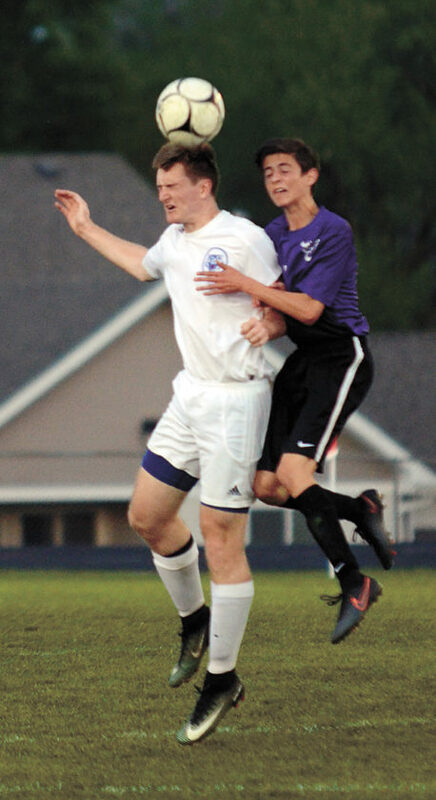 T-R PHOTO BY STEPHEN KOENIGSFELD • Marshalltown’s Mark Landherr, left, and Johnston’s Evan Kilstrom, right, fight for a header at midfield Monday night during the contest between the No. 9 Dragons and Bobcats. Marshalltown fell 4-1 on Senior Night. The next 20 minutes or so were a continuation of amped-up offense from the Bobcats (4-8), taking shot after shot. In all, Marshalltown had eight shots, with four on goal, most of which came in the first period. And before the break, the Dragons finally found their moment off a corner kick from Kevin Zhao to Samuel Fairchild to tie the match up 1-1 in the 24th minute. 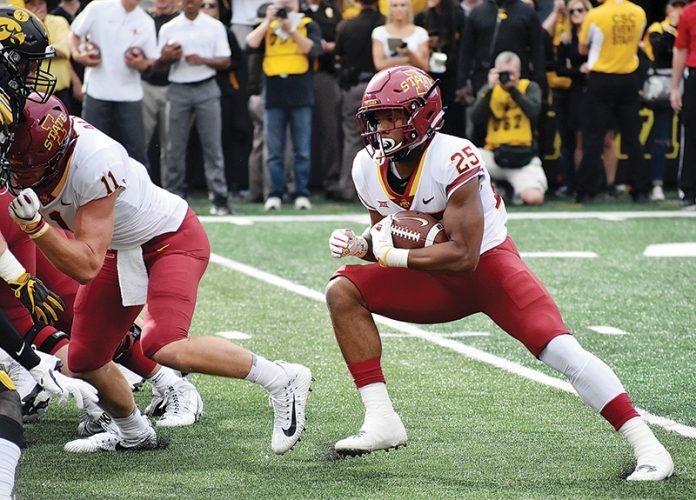 The Dragons, indeed, ratcheted up their offense to another level in the second half, tipping that scale more and more toward the purple sideline with each ticking minute. Johnston tallied 18 total shots with 11 landing on goal. Ricky Ibarra was back in the goal for the Bobcats, who is filling in for a banged-up Alec Reynolds. Ibarra had seven saves on the night, allowing two of the four goals to slam off the cross bar and into the goal in the second half. Fuchsen said the attention to detail, on crosses and set plays will be a primary focus as the Bobcats head down the final stretch of the regular season. The Johnston attack never really slowed down, as by the time the sun had set, the Dragons out played the Bobcats on corner kicks 5-0 on the offensive end. Free kicks also weighed heavily in favor of the Dragons, as they were able to steal 18 freebies to the Bobcats’ 12. Despite leading so early and so quickly, and eventually giving up that lead that transfigured into a loss, the Bobcats aren’t pressing panic or regressing. 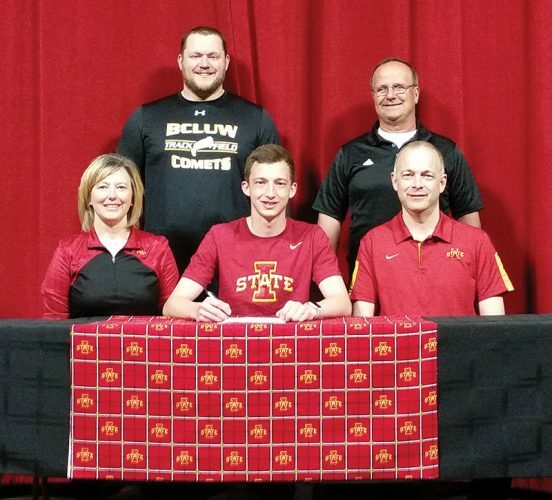 Fuchsen said the end result, a postseason run, is still obtainable if they choose to build off the losses like the one they took Monday night. Marshalltown will head to Dowling Catholic (5-7) on Friday for its next match before wrapping up the season at No. 10 Des Moines Lincoln (9-3). CONTRIBUTED PHOTO • Members of the East Marshall girls’ golf team pose with their NICL West conference championship medals after Monday’s meet at Wandering Creek Golf Course in Marshalltown. Pictured are (clockwise from front) Bobbi Amendt, Tiffany Thompson, Paula Dietzold, Jazzy Leavy, Tylyn Eicher and Amanda Paxton.